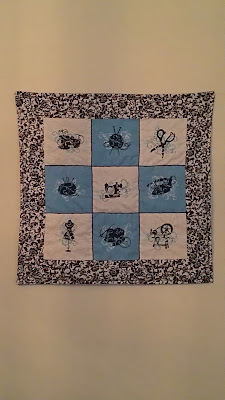 Here is the new wall hanging I have up in my sewing room. I think it's rather cute, and I know my grandma will be proud because it is the closest I have come to making a quilt in, oh, I don't know--ever? 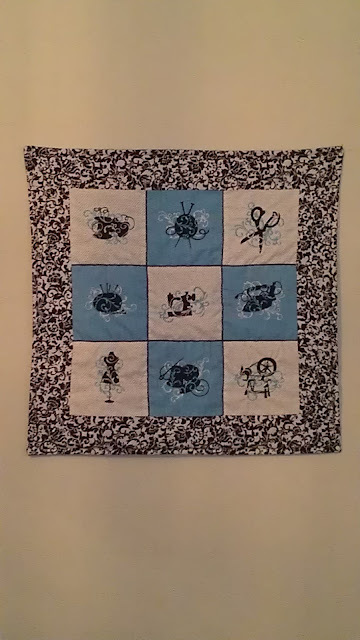 My grandma is a quilter...and apparel artist, and general crafter, etc. She is the one that taught me to sew and I'm sure she is the one who passed down the love of creating to me. Somehow, though, while I picked up all of the rest of it, I have not picked up the quilting gene. Quilting is frustrating to me. Don't ask me why; it makes no sense. I can sew or alter a wedding gown with no problem, but for some reason the fussiness of quilting drives me up a wall. 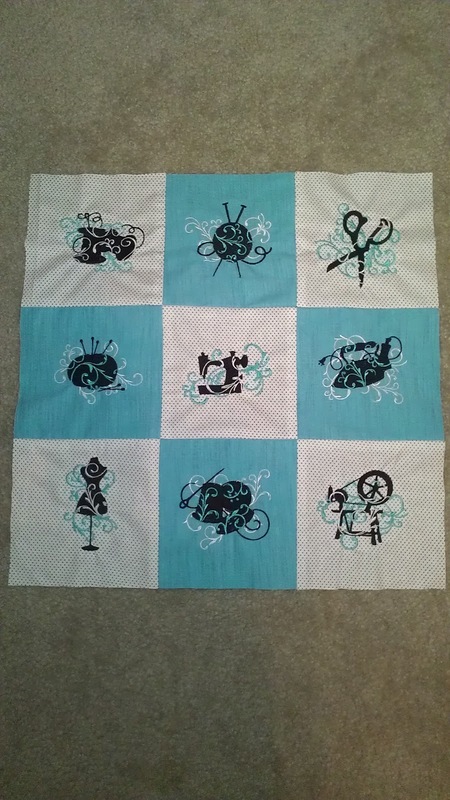 This last project may have changed some of that, though, because as I was sewing this, I started thinking what a cute bedspread it would make, and how I could totally make something like that. 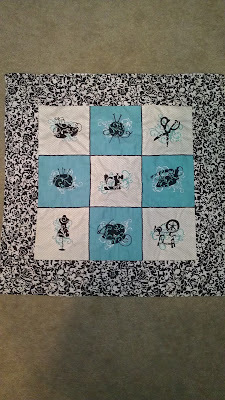 I'm pleased with how this turned out, so only time will tell if it has helped change my feelings toward quilting. Sometimes I am a very impulsive person, especially when it comes to crafting. I was searching for embroidery designs for a shirt when I stumbled across this design pack. The little filigree on the designs goes perfectly with the filigree on my black-and-white ribbons and the bottle cap push-pins in my sewing room, which I am in the process of overhauling. Suddenly all thoughts of the shirt I was planning to make were pushed to the back of my mind, and I was planning what I could do with these cute new designs. I immediately envisioned a wall hanging, and before I knew it the designs were downloaded and I was digging through my fabric. I dug out the scraps of fabric left from my Inspiration Board, knowing it would be perfect for this project and would also help tie elements of my new room together. 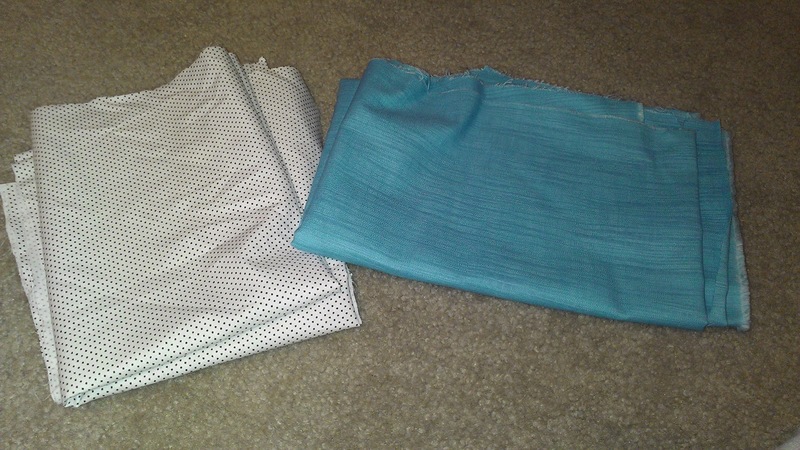 I like the uniformity that happens when the same fabric or design appears in multiple places. I kept digging and just happened to find some fabric I didn't even remember I had, in the perfect shade of blue. 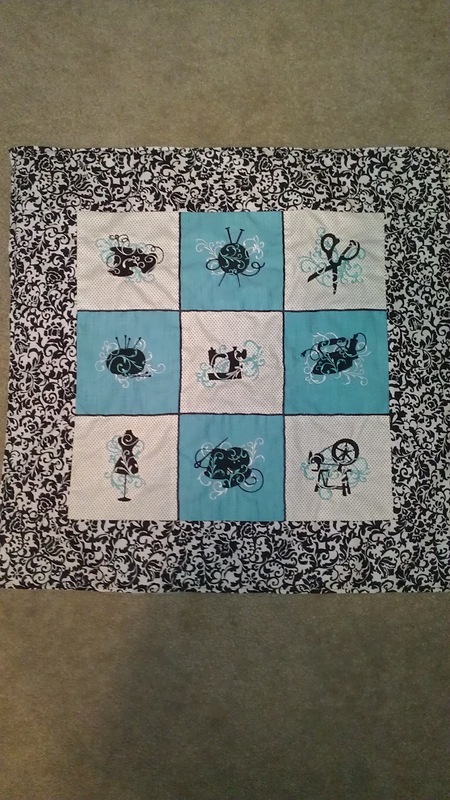 So I cut out some squares of each one, and embroidered my designs. That was the most time-consuming part of this project, although it was not difficult. The machine just does its own thing while I do mine. Specifically, I was working on this project, because it was something easy and I could put it down quickly to go change thread colors. 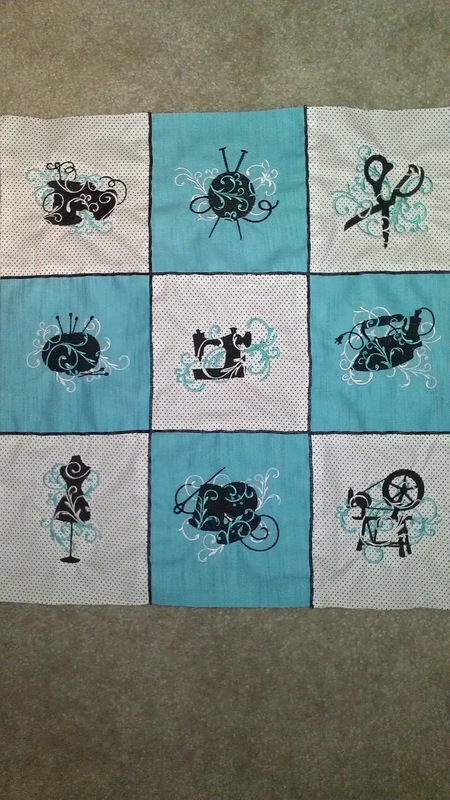 When the designs had all stitched out, I sewed the squares together. At this point I had to make a run to the store, because I did not have the right fabric for the border or the backing. As I thought about what I had so far, I decided that the wall hanging "needed something", so I also picked up some narrow black ribbon. I stitched the ribbon down the seam lines. I really think the ribbon added definition and helped the whole piece to "pop". Then I sewed the border on. After the border was on, I pinned on a layer of quilt batting, and then sewed on the backing, which I cut from the same fabric as the border. I didn't do any fancy binding; I just sewed around the whole thing, leaving a small opening to turn. Then I turned it inside out, slip-stitched the opening closed, and topstitched around the edges. To quilt it together, I merely stitched over my ribbons again, right down the seam line. So there you have it, my finished wall hanging. I love that I was mostly able to complete this project with fabric I already had on hand. 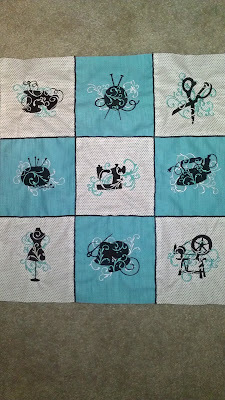 And it just looks oh-so-cute hanging in my new sewing room.